When I last saw The Wardrobe Ensemble, they were scrapping for flat-pack furniture, energetically retelling the story of a riot in a newly opened Ikea store. For their latest outing, they have fastened once again on fascinating real life inspiration, imagining the ordeal of the Chilean miners trapped underground for 69 days in 2010. 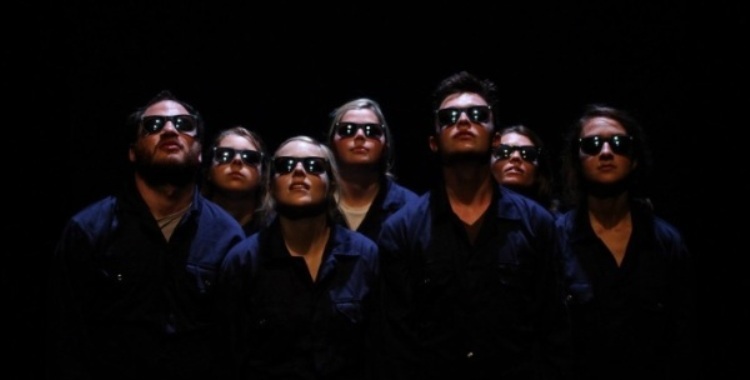 Engaging in one long game of Chinese whispers, the company explore the events of those 69 days from the fictionalised perspectives of the miners and their families, the media frenzy forming on the surface, and the people all over the globe who found a strange sort of hope in the crisis. Again, however, The Wardrobe Ensemble’s focus does not match their energy and invention. By taking on so many different viewpoints, the company find themselves moving frenetically from one to the next, failing to invest any one element with the attention it needs. In the mine itself, the trapped men struggle with the physical and mental pressures of their confinement, while also contending with a controlling psychologist who censors the letters from their loved ones; in the world outside, media and public alike get drunk on the story of miraculous survival. The lightly sketched scenes that these locations offer us are all enjoyable enough, but rarely achieve the impact of clearly delineated outlines. At the outset of the show, the company admit that theirs must be a shaky reconstruction, continuing the sort of speculation that abounded during the crisis itself. But to acknowledge this continuing chain of information and misinformation without interrogating their own act of appropriation is either disingenuous or naive. The ravenous vultures of the world’s press are vividly captured here, frantically waving papers and yelling headlines, but surely The Wardrobe Ensemble themselves are guilty of a similar act of narrative theft and manipulation. The potentially problematic implications of this, however, remain underexplored outside of their prologue. Oddly, one of the most fascinating and effective strands of the show is not set around the mine at all. Thousands of miles away, a man alone in his apartment in the middle of the night watches beaming Chilean faces on his television screen, the sound and brightness turned right up, and can feel the hope seeping into him. One by one, others join him – strangers united in their shared feeling for a group of people they will never meet. It is this overwhelming global response that feels as though it is the real heart of the piece, prodding gently at ideas of contemporary alienation and disconnection, as well as beginning to hint at the company’s own motivations for seizing on this widely documented subject matter. Despite the frustrating distraction of the piece, as the narrative reaches its heady climax the diffuse elements come briefly together, demonstrating once again the company’s promising aesthetic. As in Riot, The Wardrobe Ensemble have a thrilling ability to use their bodies in surprising ways and are often at their best in the show’s more physical sequences. Objects, too, are used economically but inventively, building a whole world from scant resources. The company just need that visual ingenuity and instinct for intriguing material to be moulded into tighter dramaturgical shape.